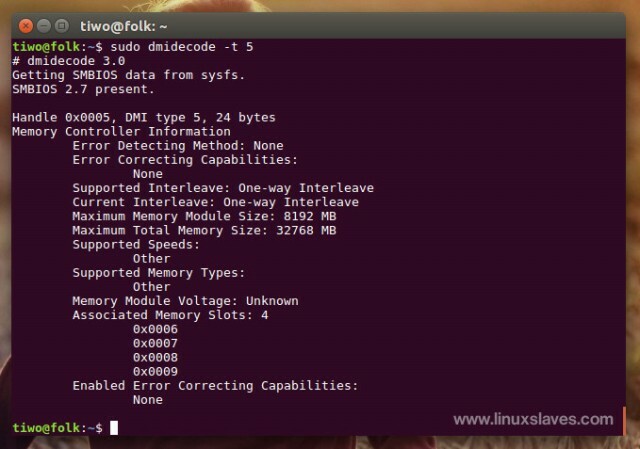 How to show and gather hardware details from Terminal Ubuntu, Elementary, Mint, Debian or any other Linux distro - Without a doubt, Command Line Interface or CLI is really really really important things you should know while learning Linux OS. It's fast and powerful way to perform any operations. 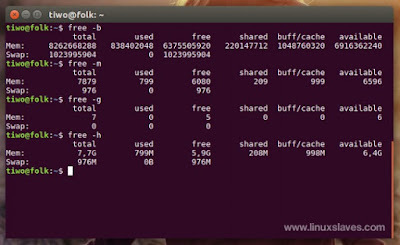 One of them is a Linux command to get hardware info such as CPU, Memory / RAM, Disk, and its kind. 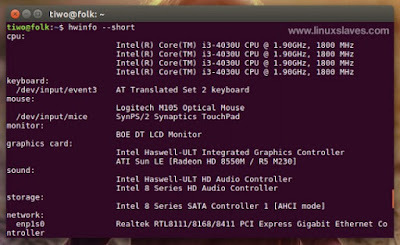 Basically, there are two options you can do to see your PC/laptop hardware information. It's GUI and CLI based approach. 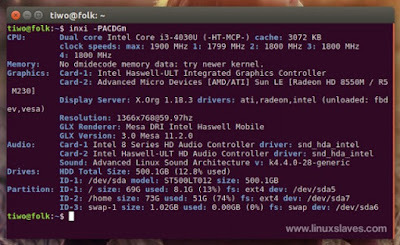 For Linux hardware info GUI based, you can go with programs such as System Monitor, and hardinfo. How about Command line based? It may a bit confusing for new user right? That is the point! 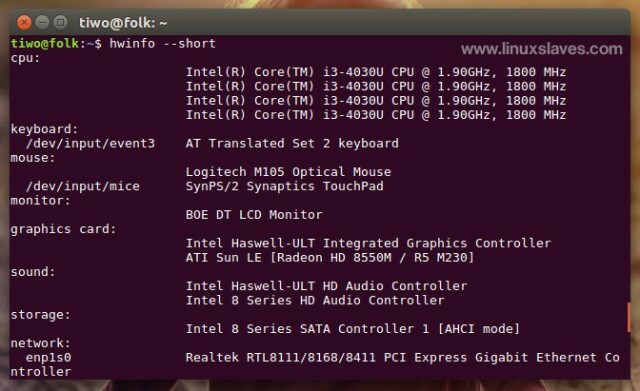 I will show you some useful Linux command to get hardware specs, configuration, info, type, of various hardware and peripherals. lshw is a small tool to extract detailed information on the hardware configuration of the machine. It can report exact memory configuration, firmware version, mainboard configuration, processor info, version and speed, cache configuration, bus speed, etc. lscpu gathers CPU architecture information from your system, precisely from sysfs and cpuinfo that placed in /proc. 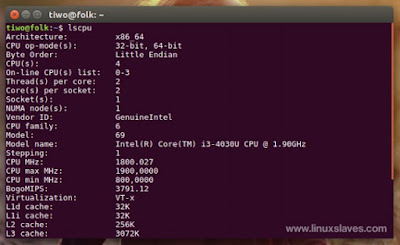 The information includes, the number of CPUs, threads, cores, sockets, and Non-Uniform Memory Access (NUMA) nodes. 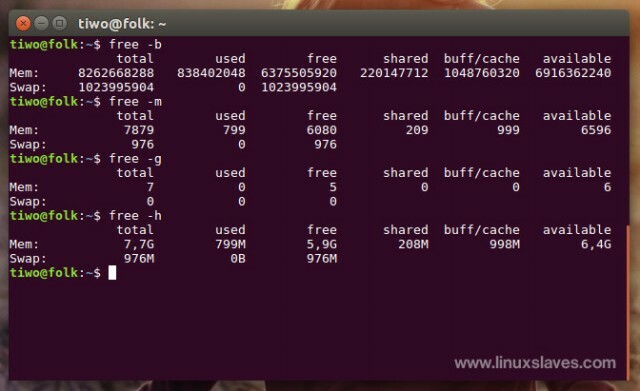 There is also information about the CPU caches and cache sharing, family, model, bogoMIPS, byte order, and stepping. Not all columns are supported on all architectures. If an unsupported column is specified, lscpu prints the column but does not provide any data for it. lspci is a utility for displaying information about PCI buses in the system and devices connected to them. By default, it shows a brief list of devices. Use the options described below to request either a more verbose output or output intended for parsing by other programs. Similar with the name, lsusb is a utility for displaying information about USB buses in th system and the devices connected to them such as USB Mouse, USB Flash Drive, and USB modem. This command can print out the name of vendor's / product's ID. 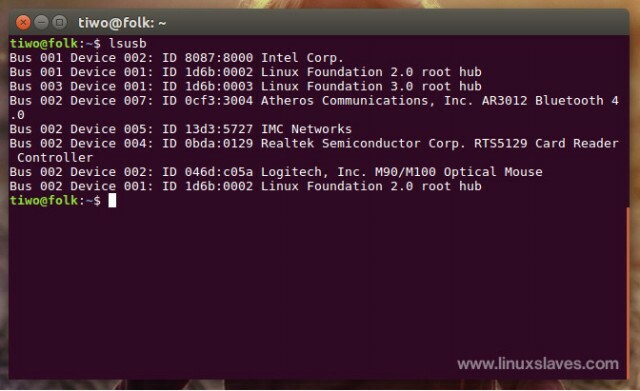 This tool is really important to setup our USB modem ( if it doesn't detected on your Linux ), and Android Rules When Installing ADB and Fastboot on Ubuntu Linux. lsblk lists information about all available or the specified block devices. The lsblk command reads the sysfs filesystem and udev db to gather information. 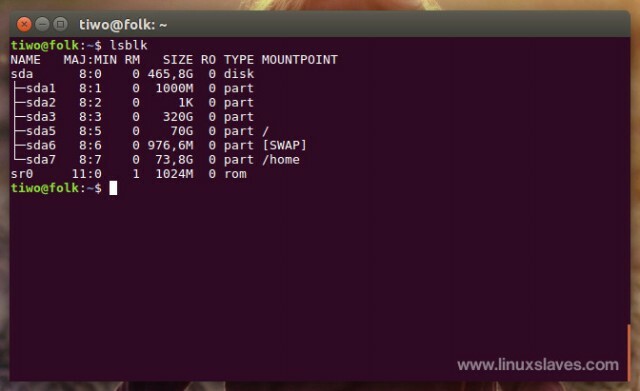 The command prints all block devices (except RAM disks) in a tree-like format by default. 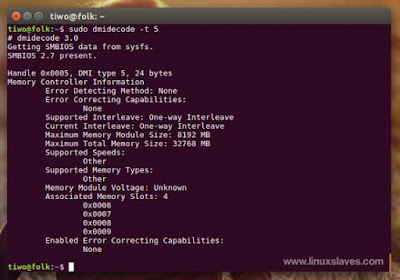 dmidecode is a tool for dumping a computer's DMI (some say SMBIOS) table contents in a human-readable format. 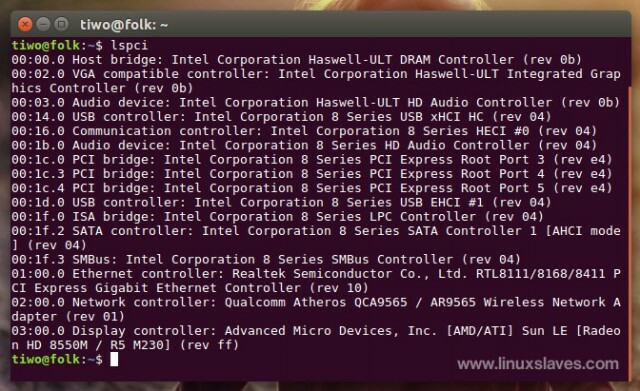 This table contains a description of the system's hardware components, as well as other useful pieces of information such as serial numbers and BIOS revision. The DMI table doesn't only describe what the system is currently made of, it also can report the possible evolutions ( such as the fastest supported CPU or the maximal amount of memory supported ). df displays the amount of disk space available on the file system containing each file name argument. If no file name is given, the space available on all currently mounted file systems is shown. If an argument is the absolute file name of a disk device node containing a mounted file system, df shows the space available on that file system rather than on the file system containing the device node. Use -h to make it human-readable. 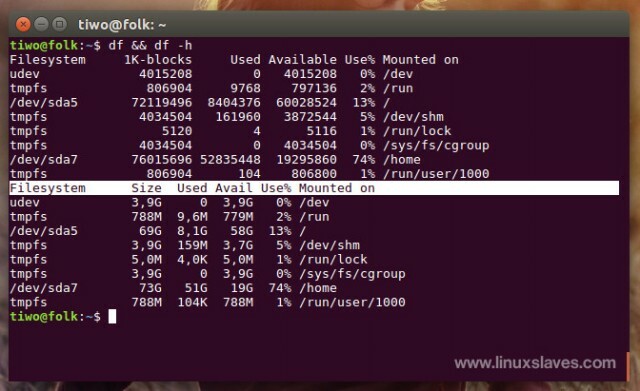 9.1 How to mount a partition from terminal? The command above will mount the sda3 to /media/tiwo/Linuxslaves. Of course you need change /media/tiwo/Linuxslaves/ with your path. 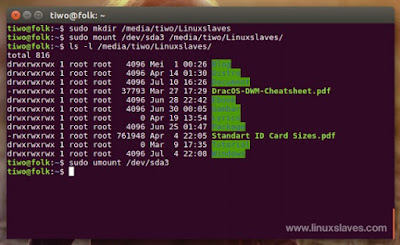 9.2 How to unmount a parition from terminal? 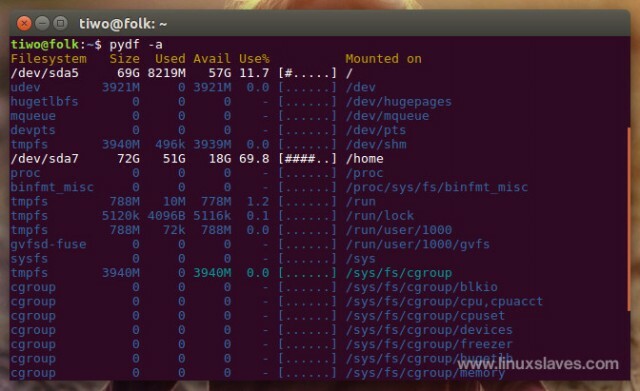 If you're have dualboot computer with Windows installed, and need to automount windows partitions you can read our post at How To Automount Windows : NTFS Partition On Linux. 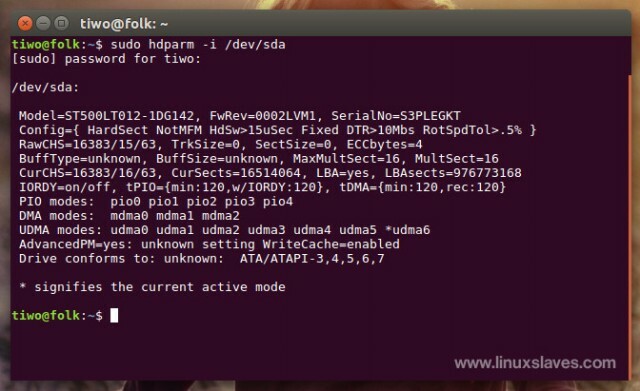 hdparm provides a command line interface to various kernel interfaces supported by the Linux SATA/PATA/SAS "libata" subsystem and the older IDE driver subsystem. 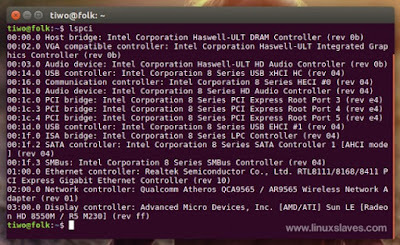 The /proc directory contain information about hardware and configurations such as CPU, memory, kernel version, disk information and etc. cat /proc/cpuinfo : Display cpu info. cat /proc/meminfo : Display memory info. cat /proc/version : Display kernel version. cat /proc/partitions : Display partition. 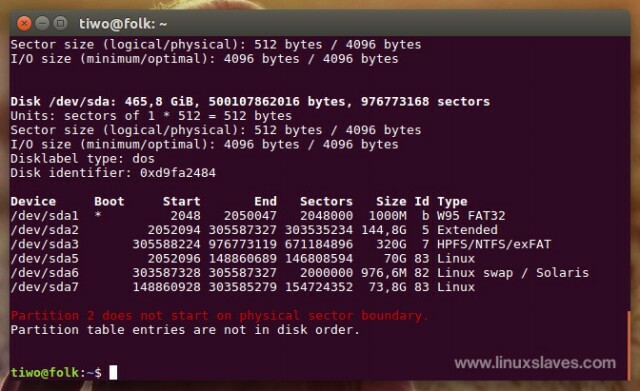 cat /proc/swaps : Display swap partition. cat /proc/scsi/scsi : Display SCSI/Sata devices. -h, --human : Show all output fields automatically scaled to shortest 3 digit unit and display the units of print out. If you need a quick way to run Linux command, why not using bash aliases? It can save your time rather than typing one-by-one. Read Bash Aliases : Create Linux Command Line Shortcut. lsscsi will list SCSI devices (or hosts) and their attributes. 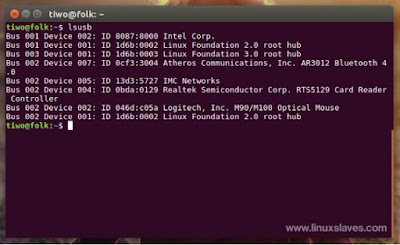 It uses information in sysfs (Linux kernel series 2.6 and later) to list SCSI devices (or hosts) currently attached to the system. Options can be used to control the amount and form of information provided for each device. inxi is a command line system info script built for for console and IRC. It is also used for forum technical support, as a debugging tool, to quickly ascertain user system configuration and hardware. 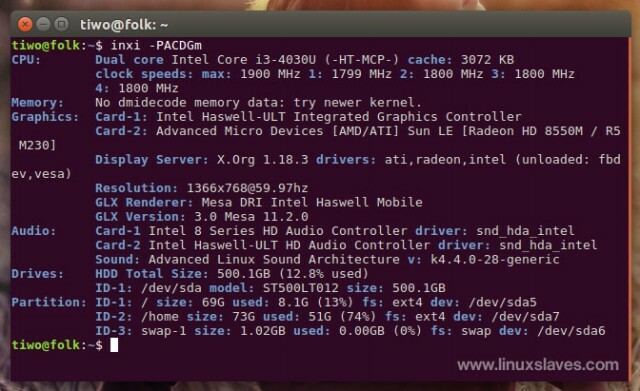 This tools will shows system hardware, CPU, drivers, Xorg, Desktop, Kernel, GCC version, Processes, RAM usage, and a wide variety of other useful information. inxi output varies between CLI and IRC, with some default filters and color options applied to IRC use. -D : Show full hard Disk info, not only model, ie: /dev/sda ST380817AS 80.0GB. 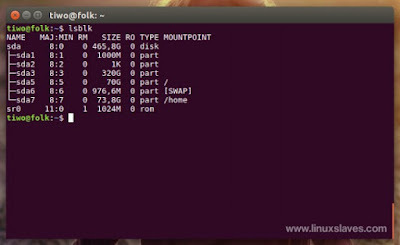 Shows disk space total + used percentage.The disk used percentage includes space used by swap partitions. -m : Memory (RAM) data. 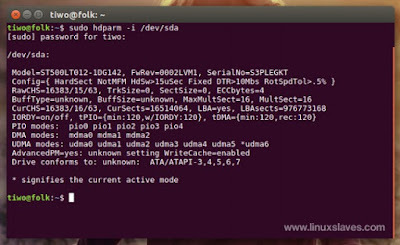 inxi can be used to show Wan IP address, and shows local interfaces. You just need to add option -i to get the information. 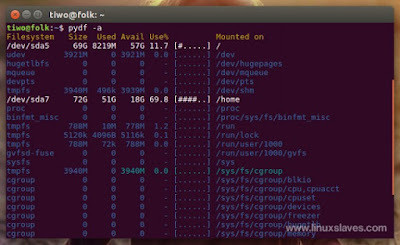 pydf is a python script that displays the amount of disk space available on the mounted filesystems, using different colours for different types of filesystems. BUGS : When running with python3, mountpoints with out-of-locale non ASCII names will not be displayed (due to inability of os.statvfs to use bytes instead of strings). hwinfo is used to probe for the hardware present in the system. It can be used to generate a system overview log which can be later used for support. The --short option will show only a summary. Use this option in addition to a hardware probing option. This handy Bash script can be used to generate one of those nifty terminal theme information + ASCII distribution logos you see in everyone's screenshots nowadays. It will auto-detect your distribution and display an ASCII version of that distribution's logo and some valuable information to the right. There are options to specify no ASCII art, colors, taking a screenshot upon displaying info, and even customizing the screenshot command! It supports many popular linux distros such as Antergos, Arch Linux (Old and Current Logos), BLAG, CentOS, Chakra, Chapeau, CrunchBang, CRUX, Debian, Deepin, Dragora, elementary OS, Evolve OS, Fedora, Frugalware, Fuduntu, Funtoo, Gentoo, gNewSense, Jiyuu Linux, Kali Linux, KaOS, Korora, LinuxDeepin, Linux Mint, LMDE, Logos, Mageia, Mandriva/Mandrake, Manjaro, NixOS, openSUSE, Parabola GNU/Linux-libre, PeppermintOS, Raspbian, Red Hat Enterprise Linux, Sabayon, ScientificLinux, Slackware, SolusOS, TinyCore, Trisquel, Ubuntu, Viperr and Void. KDE, Gnome, Unity, Xfce, LXDE, Cinnamon, MATE, CDE and RazorQt. 2bwm, 9wm, Awesome, Beryl, Blackbox, Cinnamon, Compiz, dminiwm, dwm, dtwm, E16, E17, echinus, Emerald, FluxBox, FVWM, herbstluftwm, IceWM, KWin, Metacity, monsterwm, Musca, Gala, Mutter, Muffin, Notion, OpenBox, PekWM, Ratpoison, Sawfish, ScrotWM, SpectrWM, StumpWM, subtle, WindowMaker, WMFS, wmii, Xfwm4, XMonad and i3. 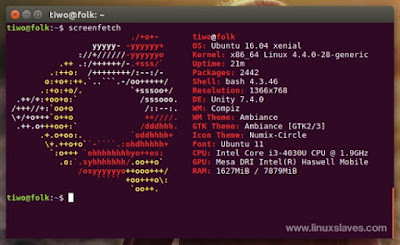 Archey is a script that displays system info in the terminal with a logo of this the Linux distro in ASCII art. 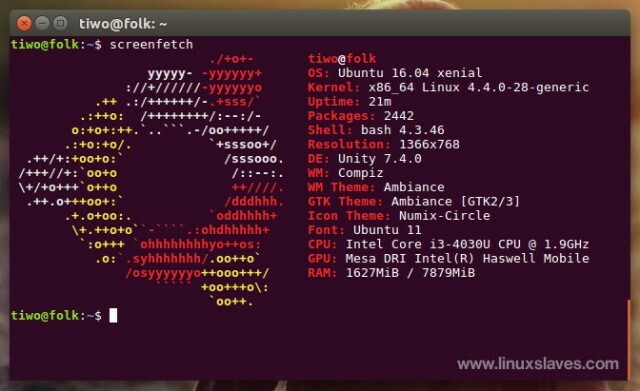 It was originally written for Arch Linux but the current version of archey supports many other popular linux distros like Debian, Ubuntu, Linux Mint, Fedora, Archbang, and etc. 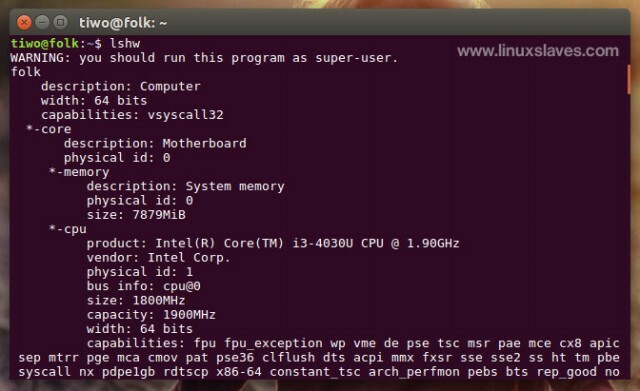 That's all I can write about a command to find hardware details and to know the hardware components of your Linux system is running on with additional tools you can install. If you have other way please feel free tell us with the comments. Thanks for visiting us!.